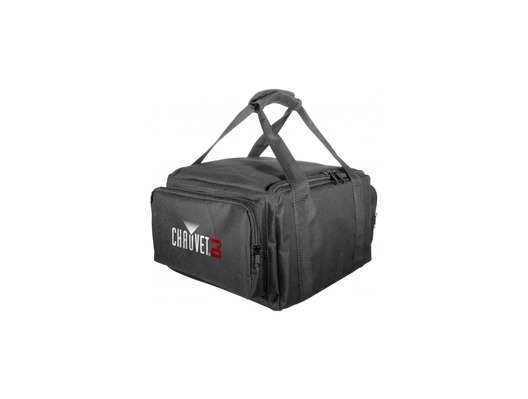 The Chauvet CHS-FR4 is a sturdy, versatile gear bag designed for protecting up to 4x Freedom Par Tri-6, Freedom Par Quad-4, or Freedom Par Hex-4 lighting fixtures during transit. It can also be used to transport other fixtures and gear by removing the internal dividers. The padding provides effective cushioning for your equipment, making transport as safe as possible, and the 2 side pockets are ideal for carrying accessories such as cables or clamps. The CHS-FR4 VIP gear bag is a durable soft-sided gear bag that features four separate compartments perfect for safely transporting the Freedom Par Quad-4, Freedom Par Tri-6 or Freedom Par Hex-4 four at a time. Removable dividers and padding make the CHS-FR4 versatile enough to transform into a perfect gear bag to protect other fixtures and gear as well. Convenient side pockets allow you to carry cables, clamps and other handy accessories.